The draw for the Foundation’s Christmas raffle has taken place and the winners are announced. Mrs Catherine Wolfe from Ballycullen was the winner of the first prize of a fully-furnished Georgian-style dolls’ house and the runner-up prizes of two Christmas hampers were won by Lucy McDunphy from Kilcock and Kevin Arundel from Ballsbridge. 1,786 tickets were sold; all of the proceeds will be allocated for the burns unit. St. James’s Hospital Foundation would like to thank all of those whose generosity made this initiative succeed: James Adam & Sons Auctioneers on St. Stephen’s Green displayed the house in their shop window giving St. James’s Hospital wonderful visibility and they also provided a point of sale for tickets, A Rubanesque of the Powerscourt Townhouse dressed the window at Adam’s beautifully, Dalcon Print printed the raffle tickets and Mrs Sandra O’Rourke sourced and provided the Christmas hampers. All of these provided support at no cost to the hospital. 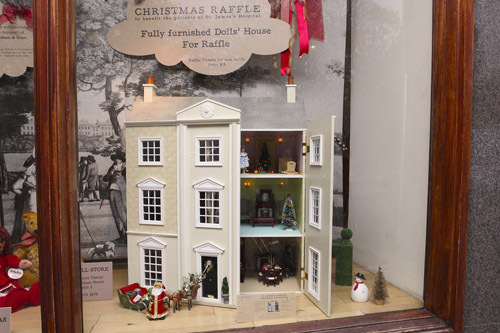 The dolls’ house and all furnishings were provided by The Doll Store in Powerscourt Townhouse. We are deeply grateful to all of those who helped us to sell tickets – and, of course, to all of those who bought tickets and supported this raffle. The National Burns Unit at St. James’s Hospital caters to severely burned patients from all over Ireland. Patients are admitted following house-fires, construction accidents and other traumatic incidents – suffering from burns ranging from 1 – 2% of their entire body skin to 90% and higher. A multi-disciplinary team provides specialist care and aims to raise €500,000 over the next two to three years to provide new equipment and infrastructural changes.